Some of you may know, but Eric Kaler, our Presidential hopeful after Bruininks will be having a public forum the next couple of days. Today, SDS and other members of the Chop from the Top Coalition will be there asking Kaler the tough questions about our University and how he intends to work for us. We want to pack the room with folks, so please come! Below are times, and a list of questions we are asking folks to ask. We’ll be distributing them before the forum tonight as well. Hope to see you there! Public Forum – Wednesday, November 17, 2010, 4:00 – 5:15 p.m. Coffman Memorial Union Theater. * The forum will be streamed on the internet and shown live via ITV connection on the coordinate campuses. * If you are interested in submitting a comment or question to be asked of the finalist, you may do so at the Forum or send an email to regents@umn.edu with the subject line Presidential Finalist by no later than 5 p.m. on Monday, November 15. Please note that due to time limitations, not all questions may be asked. Public Interview with the Board of Regents – Thursday, November 18, 2010, 11:45 a.m. – 12:45 p.m. McNamara Alumni Center, Sixth Floor Boardroom. * The forum will be streamed on the internet. Please join Students for a Democratic Society in asking Presidential candidate Eric Kaler the tough questions that affect us! 2.) It has recently been reported that there are discussions of making significant cuts to the CLA, and those cuts are taking a “student centric” approach. How is it that larger class sizes with fewer teachers actually puts students’ best interests in mind, when many classrooms are already too big? 3.) Mr. Kaler, will you cut yours and other administrator’s 6-digit salaries by 10% so that the university can spend that money on better investments: keeping clerical workers at their jobs so they can help students? When Jon Stewart was on Larry King’s show talking about his Rally to Restore Sanity, he likened himself to Alice in Wonderland and the rally as the Mad Hatter Tea Party. But is Jon Stewart really Alice, trying to find sanity in an upside-down world? Or is he the March Hare, the ultimate “slacktivist” who thinks it’s always teatime — time to sit back and jibberjabber? So let’s get this straight: people who were so horrified when the U.S. invaded Iraq that they joined millions of others to protest are not sane? We shouldn’t speak out against Wall Street bankers whose greed led to millions of Americans losing their jobs and homes? It’s irrational to be angry when you see the Gulf of Mexico covered in oil because BP cut corners on safety? Don’t get upset when the Supreme Court rules that corporations are people and can pour unlimited funds into our elections? Stewart often roasts the warmakers and corporate fatcats on his show, but he seems to think that his viewers should be content to take out their frustrations with a good belly laugh. When Jon Stewart announced the Rally to Restore Sanity, he included CODEPINK among the “loud folks” getting in the way of civil discourse. He also equated progressives calling George Bush a war criminal with right-wingers calling Obama Hitler. So we started a facebook page asking Jon Stewart to invite us on the show to set the record straight. Beware of what you ask for. We did, indeed, get a call from the producers but it was not for a live interview with Jon Stewart. No, it was for a taped session with myself, a Tea Party organizer and a tear-gas dodging, anti-globalization anarchist “giving advice” to Daily Show’s Samantha Bee about how to organize a good rally. It was clear they wanted to portray us as the crazy folks who should not come to their rally for reasonableness. I consulted with my CODEPINK colleagues. Some said, “Don’t do it. It’s a trap and will only further marginalize us.” We’d already been ridiculed several times on the show, like when we stood up to question General Petraeus at a Congressional hearing or when we organized protests at the Marine Recruiting Center in Berkeley. But the majority of my colleagues thought it would be crazy to decline the chance to get an anti-war message out to millions of viewers. The producers told us to come to the New York studio “in costume.” The anarchist, Legba Carrefour, was all in black, including a black bandanna covering his face. The Tea Partier, Jeffrey Weingarten, came in patriotic red, white and blue. I decided to “go professional”, with a CODEPINK t-shirt and a gray suit. The producers were disappointed. They had wanted me to appear in one of the wild outfits we have worn in Congress — like a hand-lettered pink slip accessorized with a hot-pink boa and a glittery “no war” tiara. But my attempt to look professional was thwarted by the fourth guest who suddenly appeared and was positioned right behind me: A huge, scary puppet head of Iranian President Ahmadinejad. So there we were, four “crazies” being quizzed by Samantha Bee for over two hours. She started out with softballs — what did we stand for, what activities did we engage in. Then the questions and the antics got sillier and sillier. By the end we found ourselves spinning a blind-folded Samantha Bee around, then watching her swing a baseball bat at Ahmadinejad’s head to see if was really a pinata. I’m sure that with over two hours of tape, there will be plenty of footage to turn into a four minute segment showing us as a bunch of nutcases. After all, it is a comedy show. But it’s too bad that Jon Stewart, the liberal comedian, is putting anti-war activists, tea partiers and black bloc anarchists in the same bag. And it’s sad that he’s telling his audience — many of whom are young progressive thinkers — that activism is crazy. An anonymous assistant on the Daily Show’s blog chastized CODEPINK on line. “Dipping hands in fake blood or screaming over everyone just makes you look crazy and then the rest of the country ignores you.” He said that we should, instead, focus on solutions. CODEPINK has been proposing solutions since the day we started. We risked our lives meeting with UN weapons inspectors in Iraq right before the U.S. invaded to see if war could be avoided. We have repeatedly traveled to Afghanistan to push for reconciliation. For the past eight years we have been posing solutions about how to deal with terrorism, how to extricate ourselves from the wars in Iraq and Afghanistan, how to make us safer at home. Whether under Bush or Obama, our voices of sanity have been drowned out by a war machine that makes billions selling weapons and hiring mercenaries. Meanwhile, we’ve witnessed the agony of mothers who have lost their sons in these senseless wars, the unspeakable suffering of our friends in Iraq and Afghanistan, and the lavish spending on war while our schools and hospitals are gutted. It was because of this insanity that we began to interrupt the war criminals during their public appearances, shouting — yes, shouting — for an end to the madness. It was because of this insanity that we put fake blood on our hands to represent the hundreds of thousands of innocents who died as result of their lies. In our post-9/11 24/7 news cycle, we learned that the more audacious and outrageous the action, the more likely we were to get our anti-war message into the national conversation. For this the Daily Show calls us crazy! Don’t get me wrong. CODEPINK women love to laugh and we try not to take ourselves too seriously. But we do feel that it’s the sane people who protest crazy wars, who cry out against the dangers of global warming, who rail against big money in politics, who implore our politicians to spend our resources rebuilding America, not bombing people overseas. So let’s celebrate the people who walk the talk. Slacktivism did not end slavery, activism did. Slacktivism did not get women our rights. Activism did. Slacktivism won’t end war or global warming. But activism just might. Jon Stewart says he wants to restore sanity to Washington; so do we. We’ll see you out on the mall, Jon. Medea Benjamin is cofounder of CODEPINK and Global Exchange. CODEPINK will be organizing a Mad Hatter Tea Party at the Rally to Restore Sanity. To join, click here. Her “interview” with Samantha Bee will be aired on the Daily Show on Thursday. Hi, I’m Grace, from Students for a Democratic Society at the U of M. Many of you may be familiar with the SDS of the 1960’s, who led the student movement against t…he war in Vietnam, with protests and burning draft cards. The SDS of the 60’s challenged the US government’s agenda in Vietnam, which was essentially to pile up bodies in the name of Freedom and Democracy, and later, to pile up more bodies for the sake of saving face. As a result of mounting pressure from a strong, united anti-war movement, the US government eventually gave into public opposition and ended the war in Vietnam. You might think that our federal government would learn from this hard lesson of humiliating magnitude, and they did. Today, there is a new and improved version of the “red scare” to distract the public from the ever growing pile of bodies in Iraq and Afghanistan: it’s called the threat of terrorism. An example of this “eye of the beholder” definition of terrorism is how people look at the struggle of Palestinians. The US government lists various Palestinian political parties as terrorist organizations, and sends military aid to Israel to combat these organizations. My friend and fellow SDSer, Tracy Molm, argues that the Palestinians have a right to fight for their native land. Now Tracy, along with other anti-war and international solidarity activists in our community, has been raided by the FBI and subpoenaed for a Grand Jury. There are no charges against her or the other activists. The FBI claims they are looking for evidence of “material support to terrorists.” One might wonder, what does material support even mean? Because let’s be honest, Tracy doesn’t have money to fund foreign political parties, she has barely enough to fund herself and then buy pizza for an SDS party once in a while. We also wonder, since when does using your freedom of speech mean you get the FBI at your door? We can probably thank the Patriot Act for that one. 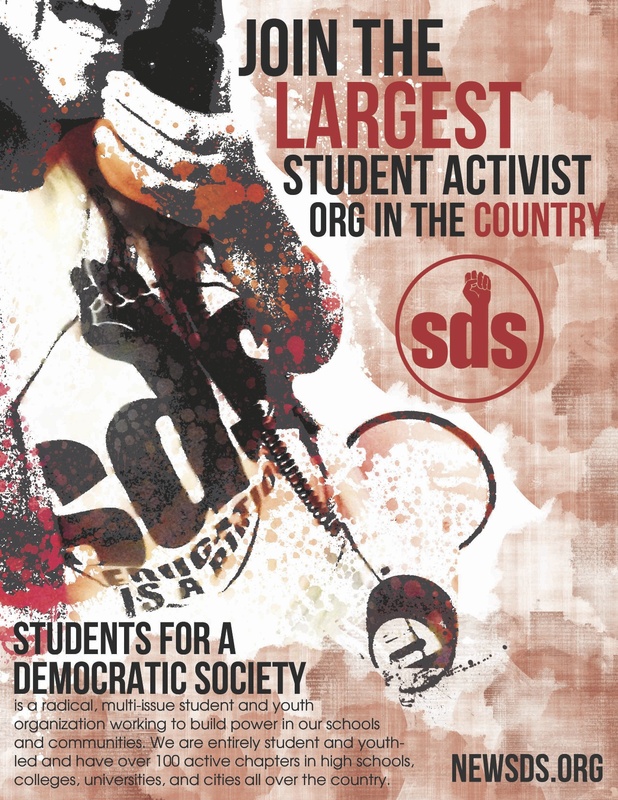 Some of you might be thinking, “well sure, but she’s probably done something wrong, right?” Let me tell you a little bit about what we do in SDS–we do a bit of rabble rousing, but I‘ll let you all judge whether it merits federal repression. Like the SDS of the 60’s, we challenge the institutions that oppress us in this country. We fight for the rights of all people, rights that the ruling class likes to chip away at. For example, take the education system. I bet we can all agree that educating all of our citizens is a good idea; SDS would call this a right. The ruling class discovered long ago that education RIGHTS are inconvenient and generally get in the way of accumulating wealth. So they defund public schools and then close them, as in the case of North High, or make schools into corporations, as in the case of the University of MN. The U of M was founded as a land grant institution with the purpose of providing access to higher education to all Minnesotans. But as tuition goes up, and its gone up by 150% in the past 10 years; an education at this public institution becomes less and less an option for working class people. You might think that all the extra tuition revenue is at least funding a more quality education, but in reality, our tuition dollars fund research and fancy building projects and bloated administrative salaries while our class sizes grow and our support staff get laid off. Recently, to add insult to injury, there have been threats from the administration that our cultural centers might get kicked out of their spaces in the student union. Why? Because there “isn’t enough room” apparently even as they’re expanding the Rec center and spending $80 million to renovate Northrop theater. So SDS, once more, is taking a stand. We stand for education rights for all, and a university that values its students, teachers, and employees more than its revenues. We stand with the cultural centers for a university built on community. We stand with our brothers and sisters who have been targeted by the FBI–they have done nothing wrong. And we will continue to stand with any person or organization that speaks out against U.S. imperialism and corporate greed. We invite you to join us in the struggle for a better university, and a better world. Thank you.